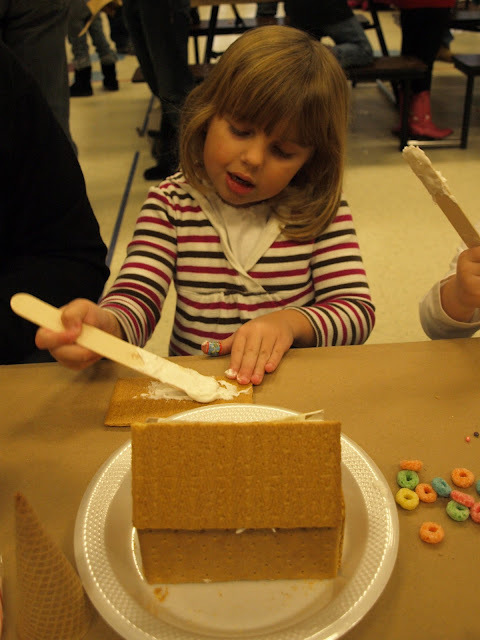 Zoe's school has an annual "Gingerbread" House Workshop. 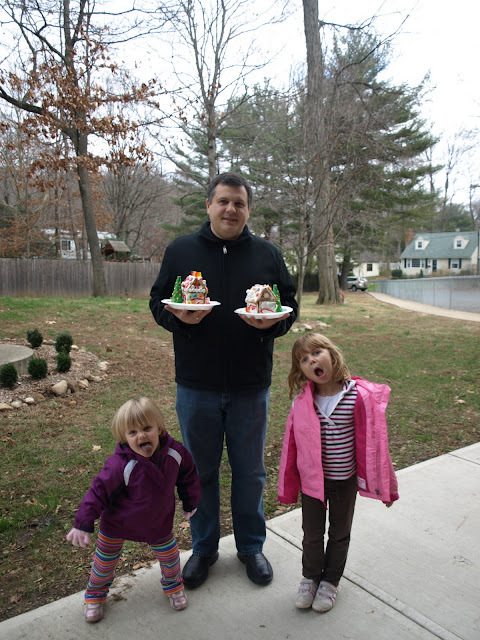 We were very excited to go build our own gingerbread houses... and we made it a family activity. Nick started out doing a lot of supervising... but I could tell he wanted to jump right in and help. (One of the other moms told me ahead of time that after last year her husband asked her to order an extra kit so he could do his own while their daughters worked on theirs. I'll know next year to order 3 kits for sure.) Eventually Zoe asked for help and he was happy to oblige. My favorite part of the entire activity??? Ana's concentration faces. You know you're not REALLY concentrating unless your tongue is involved. This was one of those activities that you know the kids will enjoy... but you are still surprised by just how much they enjoy it. They had these looks on their faces for the entire 45 minutes! Again... Ana's tongue helps her concentrate. The end results were pretty impressive I think. This one is Ana's. I did a lot of her icing... but she did just about all of the candy (when she wasn't licking her fingers and sneaking snacks). Zoe loved the whole thing. She was excited about the house building... and she was excited we were all doing a project together in her school. I tried to get some photos of the end products with Zoe and Ana. I wasn't too successful. Zoe's face says "I just wanna go play with those kids over there." Ana's face says "I wanna eat my cake." Zoe's face says: "I can't believe you're still taking pictures when I just wanna play with those kids." Ana's face says: "I wanna eat your cake, too." We buddled up and headed home. When we were outside I made one last attempt (or 12) to get a decent photo. All I got was proof that the girls had ended up with as much candy in their bellies as they had on their houses. I can tell you this... we'll be signing up for the Gingerbread House Workshop again next year!